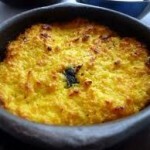 Cheese Humitas is a Bolivian food recipe of corn puree baked in the oven. Spray a 9-inch baking pan with vegetable oil cooking spray. In a blender or food processor, puree the thawed corn and milk until smooth. In a large mixing bowl, stir together cornmeal, sugar, baking powder, salt, anise seeds, and cinnamon. 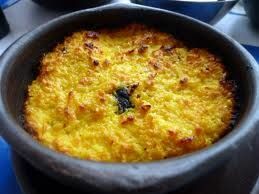 Add beaten eggs and the pureed corn, mixing well. Spoon the batter into the prepared pan. Top with cheese and sprinkle with paprika. Bake for 40 minutes or until done. Cool for 10 minutes before cutting into squares.